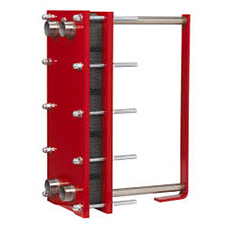 Plate Heat Exchangers (PHE) is a type of heat exchanger that uses metal plates to transfer heat between two fluids. 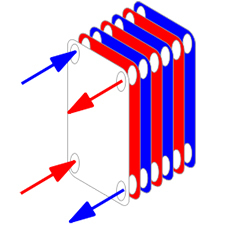 This has a major advantage over conventional heat exchangers, in that the fluids are exposed to a much greater surface area therefore the size of the unit is much smaller than a conventional shell and tube. Serck can supply many different configurations of PHE as per parameters. Plate packs are available in AISI 304, 316 stainless and titanium, with gaskets in nitrile, EPDM or viton. Let us know your required inlet and outlet temperatures, for both process and cooling medium, fluid types and flow rates along with working pressures, capacity and we can quickly size your unit and quote accordingly. Serck stock a wide range of gaskets for fast moving PHE’s from most manufacturers and can complete and re-gasket job within a week. We have specialized team to go on board/site and re-gasket if need be. Serck can offer several options for cleaning or servicing your PHE. We can clean in place by circulating suitable chemical cleaners through the unit. Alternatively the unit can be dismantled; plates cleaned and checked for cracks or pin hole leaks by Light Box inspection then reassembled with new gaskets.